Cartoon Brew has an article about the first teaser trailer for the new CGI (of course) feature film version of Blinky Bill. Wot, ye’ve not ‘eard o’ Blinky Bill? 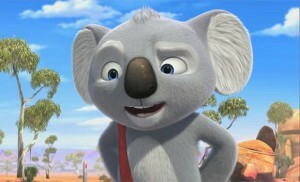 He’s one of Australia’s most famous animated animals: A young koala with an adventurous attitude and a strong environmental heart. “Blinky Bill first rose to fame in the 1930s in a series of lavishly illustrated and conservation-themed books by Dorothy Wall. A new generation of children… was introduced to Blinky through the classic 1990s animated series The Adventures of Blinky Bill.” The new CGI film features Ryan Kwanten (True Blood) as Blinky Bill himself, while other Australian voices include Toni Collette and Barry Humphries (“Dame Edna”). The film is directed by Deane Taylor, who previously was art director on The Nightmare Before Christmas. Interestingly, the same article makes mention of another upcoming film called Larrikins, in production over at Dreamworks Animation and featuring contributions by musician & comedian Tim Minchin. “Larrikins tells the story of an uptight bilby (a desert-dwelling marsupial), who has lived a sheltered life in the safety of his family burrow. When he ventures out and becomes privy to a dangerous secret, he finds himself launched on a musical adventure across the mystical and untamed Australian outback.” Larrikins was originally scheduled for a 2018 release, but there’s no word yet if all the recent shake-ups at Dreamworks will change that.